If you open your mailbox and you smell something good, don't get too hungry just yet. It might just be a postcard with an imprinted smell. This smell-imprinting printer is just in a concept stage right now, but it already won the "most fun" award in the Sony Student Design Workshop 2012, as reported by Wired UK. Li Jingxuan, a Chinese student from the Fashion and Art Design Institute of Donghua University, thought of the device to catalogue the smells of the tasty food she encounters during trips. Taking pictures of food and uploading them to popular social media sites has been a growing love for the foodies out there. 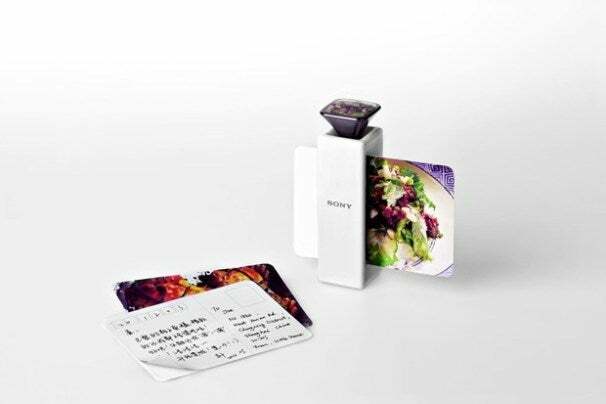 With this device you can share just a little bit more by imprinting the smell along with a picture on a post card to tease friends and family with what they're missing out on. In concept, it works by using an aroma sensor at the top of the device to sample the aroma and simulate the smell with different mixtures of aroma inks. A Japanese lab has been toying around with printing smells for a couple of years now, so this little could become a reality in the near future. But who says to stop with food? Anything with a strong smell can be recorded and printed onto paper; flowers, perfumes, cosmetics or basically anything that emits a strong enough odor. That could also lead to some pretty funny pranks. Mail your friend the scent of your dirty socks or return the smelly favor after they use your bathroom. It's obvious the device could be very versatile, for good and evil. Perhaps a device like this would really make things like the postal service and scrapbooking popular again. Receiving physical post cards from friends and family with that extra sensory detail may just be bizarre and fun enough to get people to physically send a letter. Your move e-mail!